Use door protectors to protect agains the most common form of parking lot damage, car door dings. 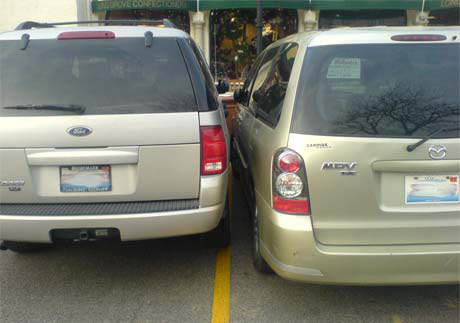 Sometimes you can't avoid a tight parking spot, someone inconsiderate might park way to close to your car. The ford is parked way too closely to the mazda, so close that there's no way the passenger of the ford and driver of the mazda could get in their car through their own doors. I guess they are going to have to get in through the trunk! The doors in this case are useless and so these people probably didn't try to open them and inadvertantly cause a car door ding. Car door dents are very common and hard to avoid because they usually happen after you have parked and left your vehicle. Not everyone is considerate of other peoples vehicles that they park next to, this is the case that usually results in parking lot dings. This is why car door guards are available and is a must have for anyone who often parks in crowded parking lots or someone who parks in the city. By using these door guards you can stop 100% of parking lot door dings. This can save you tons of cash by preventing the need for repainting and body work.